Question: I'm not a big fan of butter cream icing but I know that it holds up well for decoration frosting. Is there a variation that would hold up but would also include cream cheese? Thanks for this site! Its wonderful! Hi Melanie, Thanks :-) and your welcome. Be prepared for a lot of compliments on the carrot cake. May I suggest the best carrot cake recipe on this website? Now to your question. Using cream cheese frosting is doable, I personally prefer using buttercream as a final finish. The cream cheese tends to be a little on the transparent side and it is not as smooth. Here is what I would suggest to you so that you get the best of both world's. Crumb coat your cake with the cream cheese icing. Then give it another coating of the cream cheese icing as if it were your final coat. After refrigerating it, put a final finish on using the buttercream. The carrot cake icing page describes exactly what I just said here. An alternate to that method, you could use more butter in your cream cheese recipe or as I have done before, take your buttercream icing and add whipped softened cream cheese to it. You may have to add some confection sugar to the mix to get it to the right consistency and sweetness. There are two buttercream recipes here on this website. One is the Italian meringue using egg whites and cooked sugar syrup. The other is a super easy buttercream version and it tastes great too. Read this post by Robin. She gives the most amazing buttercream recipe to us all, along with her red velvet cake. I have tried it and freaked over it. It's not as sweet as the usual frostings and it's very smooth. It requires some cooking, but it's worth the effort. And of course you can use it on any flavor cake. The Italian meringue recipe that I give you on this website is not very sweet at all, in fact some say it's not sweet enough. I find that in combination with the sweetness in a cake, it's perfect. Alone, it may not seem sweet enough. You can always add a little more sugar syrup or confectionery sugar to suit your personal taste. I hope that helps and am looking forward to hearing how your cakes turn out and what you decided to do. Please share your cake at this link. 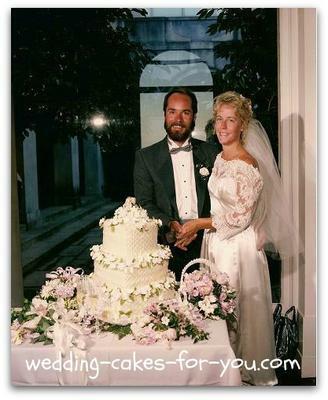 Share Your Wedding Cake Photos Invitation.